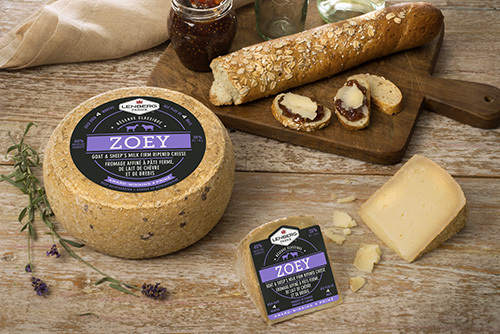 The award-winning line of premier Canadian cheese, Lenberg Farms Classic Reserve, has added the newest artisanal cheese to its collection, Zoey. Made from the highest quality blend of sheep and goats milk, each wheel is carefully matured four months. This mild, semi hard cheese comes from Mariposa Dairy with dedicated cheese makers who hold a passion to produce the highest quality cheese. Zoey's harmonious balance between sweet sheep's milk and tangy goat's milk creates a creamy white paste with a rich, buttery texture that holds hints of grassy notes and subtle woodsy tones. Cured with a hand-washed rind the cheese naturally ripens to enhance the true flavors and pleasant aroma. Lenberg Farms newest addition will not only win the hearts but also the taste buds! Application: Enjoy Zoey sliced on a cheese board paired with spicy Italian mostardas or sweet dried fruits. Layer mild slices on top of cured meats for an exquisite Panini or dice and melt for a refreshed fondue. Pairing: Pair this blended milk cheese with rich & peppery Zinfandel or Chardonnay.